In 2009, Harper's Magazine sent war-crimes expert Lawrence Douglas to Munich to cover the last chapter of the lengthiest case ever to arise from the Holocaust: the trial of eighty-nine-year-old John Demjanjuk. Demjanjuk's legal odyssey began in 1975, when American investigators received evidence alleging that the Cleveland autoworker and naturalized US citizen had collaborated in Nazi genocide. In the years that followed, Demjanjuk was twice stripped of his American citizenship and sentenced to death by a Jerusalem court as "Ivan the Terrible" of Treblinka--only to be cleared in one of the most notorious cases of mistaken identity in legal history. Finally, in 2011, after eighteen months of trial, a court in Munich convicted the native Ukrainian of assisting Hitler's SS in the murder of 28,060 Jews at Sobibor, a death camp in eastern Poland. An award-winning novelist as well as legal scholar, Douglas offers a compulsively readable history of Demjanjuk's bizarre case. 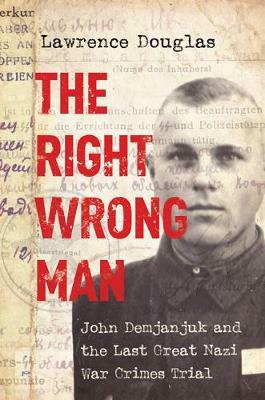 The Right Wrong Man is both a gripping eyewitness account of the last major Holocaust trial to galvanize world attention and a vital meditation on the law's effort to bring legal closure to the most horrific chapter in modern history.